Who doesn’t love a good bargain? I know I do and nothing makes more happy than finding and getting a great bargain on my makeup. As a cosmetologist and beauty addict, I’m not ashamed with looking beautiful and wanting to try out every new product to hit the market, but unfortunately my financial advisor, aka my husband!! He does love how beautiful I am and doesn’t gripe at me that much, I mean with these beautiful eyes who can resist? As good as those $75 lipsticks make my lips look, the idea of spending that much money on one single item make me stinks. That’s why drugstore makeup dupes are always oh so sweet!!! The aisles of your local drugstore are lit with floourescent lighting and cramed with products and advertisements and don’t exactly resemble the MAC counter in your local mall, but they are filled with some just as amazing beauty products, from the best matte eyeshadow palettes and mascaras to full coverage foundations if you look hard enough you can find quite a few diamonds in the rough. But why waste your time, I have put together a thorough list for you right here!! 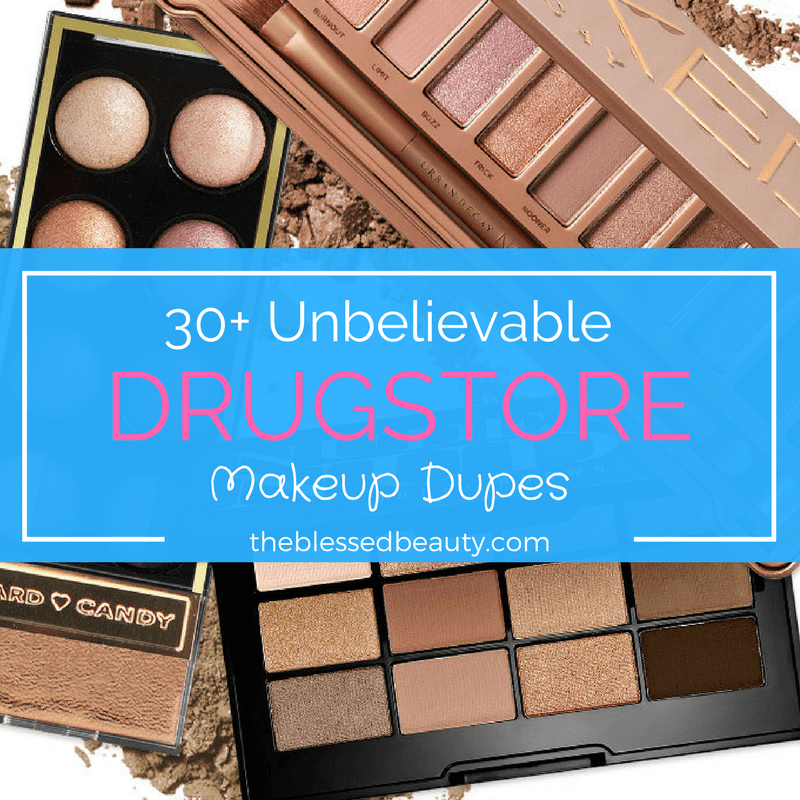 The Blessed Beauty’s Top Drugstore Makeup Dupes list consists of 30 cheap drugstore makeup products that will send their high priced rivals packing. But there is one catch, are you ready? You can’t get mad at me for showing a cheaper alternative to your favorite high priced makeup item, promise. In the past I have created specific lists for all the different types of makeup, mascaras, foundations, eyeshadows, etc. In this list you will find them all, a best of the best so to speak. Trust me when I say I have tried all of them not only on myself but my customers and my favorite guinea pigs, my daughters. Rarely and I mean rarely can you even tell the difference between the two. What makes this list oh so sweet is the fact that most of these products cost less than the price of your daily latte or favorite dessert. Hopefully you liked this post as much as I did writing it. Don’t forget to BOOKMARK this page for your reference! I will definitely be adding more to this list as I find new drugstore dupes for high-end makeup! Don’t forget to Pin the images above to keep it all handy! Previous Post Guaranteed Tricks to Make sure you Never have a Bad Hair Day Again! Next Post Which Naked Palette is Best?